We’ve all been there with the inevitable red wine spills that turns into red wine stains. We watch it happen in slow motion as it unfolds in front of us with our eyes bulging in horror. It doesn’t matter when or where it occurs – you may have been a bit too comfortable and lethargic on the couch with a glass in-hand, or were a little too vigorous with the hand gestures while explaining a story. At the end of the day, it happens, but it doesn’t have to be a colossal tragedy. There are a couple of things you could do when you realize your red wine is everywhere except in your glass. First, of course, is to panic. Don’t panic! Even if red wine is all over your favorite shirt, it can be saved! Employ a tried and true method to beat the stain before it gets you down. So instead of fretting over those red wine stains staring at you, take a few deep breaths and walk with us as we help you through the cleaning process. Although you can take care of a red wine stain in the morning, attending to it immediately is always the best solution. With the exception of a few types of fabrics, most fabrics are highly porous. When liquid matter gets into the fibers, they become immersed into the fabric’s pores. Unlike many of the other drinks we enjoy, red wine’s color is completely natural. The grape-based beverage contains chromogens, the primary substance in many colorful plants that are responsible for dyes. Yes, dyes. 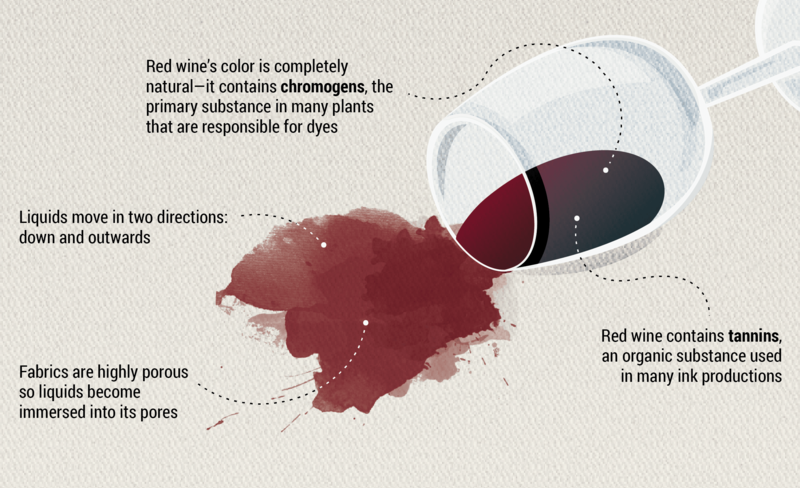 Red wine is essentially a giant bottle of dye molecules. Combine this with red wine’s naturally occurring tannins, an organic substance also used in many ink productions, and your red wine stain is essentially a DIY tie-dye experiment gone wrong. Once red wine hits a fabric, it begins to sink into the fibers, with the liquid moving throughout the fiber’s pores wherever it can find space. Red wine, like all liquids, will move in two directions: down and outward. Tip #1: Do NOT scrub the stain! Scrubbing will help pull some of the red wine out, but actually negatively impacts the stain as it causes it to spread outward even more. And, if you’re applying too much pressure, you’re actually pushing more red wine down into the fabric. This is especially true if you’re dealing with a red wine stain on the couch or on the carpet. While it’s tedious to deal with a red wine stain immediately, we wouldn’t recommend waiting until the next day to take care of it. Red wine will sink and settle into those fibers the longer they’re there. Eventually, they’ll “set” and become more difficult to remove. Not forgetting, of course, that red wine is basically a dye waiting to happen. The last thing you want is for the stain to dry, but even worse is if the stain dries when hot air is applied. Heat will actually change the chemical process the stain undergoes when it dries. If you apply heat, you can expect a permanent or nearly permanent stain. So, put the hair dryer down, and for goodness sake, don’t put any stained clothes in the dryer before you apply any pre-wash cleaning methods. So you’ve got a red wine stained carpet and a nice splash of red wine on the couch. You’re taking care of it right now, and you didn’t start scrubbing away like a mad man (or woman). Now what? These dry materials will “pull” the red wine out of the carpet, but don’t just start rubbing them in. Remember, you never want to rub (or scrub) the stain, regardless of what you’ve applied to it. Always apply the blotting method, even when it comes to cleaning up the salt or powder. If your salt treatment didn’t quite work, or you need something a little extra to address the stain, applying some liquid measures may solve your problem, with some guidance of course. We’re not sure who started this silly rumor, but don’t believe it. White wine is not a cleaning agent, nor will it counteract the dyeing agents in red wine. In fact, white wine may just cause your red wine stain to spread out even further. For your own sanity, and to avoid wasting precious white wine on a red wine stain, seek better, alternative methods. Dry heat is very different from, well, wet heat. Hot water is a wonderful substance, especially when applied to other materials as a cleaning agent. It may cause the red wine to dilute and spread out a bit, but the hot water will also cause the molecules in the red wine to lose a bit of cohesion with the fabric, making it easier to clean. If this completely doesn’t work, you can try other methods. Milk has absorption qualities to it. You can try pouring milk on the stain liberally, letting it sit for a few minutes, then blotting it up with a sponge or dry rag. The minerals added to club soda may actually make it a better alternative than water. These will actually help absorb and break up the red wine molecules, which you can then blot up more easily. You can also apply club soda with white vinegar to help improve the result. “Oxi” cleaners are an almost magical way to help remove stains early as well as already dried stains. These cleaners use sodium percarbonate which, when combined with water, breaks down into hydrogen peroxide. They’re great at breaking up stains, so if you have any, apply it to the stain, wait a while (20 minutes to an hour) while it does its job, and then blot the stain away. If you don’t have an oxi cleaner, chances are you do at least have dishwashing liquid and hydrogen peroxide somewhere in the house. Mix about 3 parts hydrogen peroxide and 1 part dishwashing liquid, then apply to your red wine stain. Let it sit for a while (think 20 minutes to an hour) to do its magic. Then, blot clean before attempting to fully wash out the mixture. Every stain is different. You may find yourself with a fresh stain on a piece of clothing, or a dried red wine stain on a couch. For different types of materials and different types of stains, you may find success with one method over another. Even after all methods are applied, you may still find your red wine stains just aren’t going away completely. You may be struggling to figure out how to get red wine out of clothes after washing, for example, as those stains may still exist if you put the clothes in the wash without applying a pre-wash method. If your red wine stained carpet dried for far too long, your stain may sit there even after you apply an entire bottle of an oxi cleaner and hot water. So just remember, time is of the essence! If you wait too long, that red wine stain may end up being impossible to remove. Therefore, act fast, make sure you have at least two of the solutions mentioned above on hand, and get to work.